I’ll be off to the main downtown Cenotaph for the ceremony and two minutes of silence today, but after you do your own two minutes, here’s a pair of relevant songs for today. I first heard “Green Fields of France” at ten or fifteen years ago, after a backpacking trip through Europe that had included time at Ypres, including a walk out of town to see John McCrae’s grave. Here’s the Dropkick Murphy’s cover. At our main cenotaph ceremony here, we always have both a Royal Canadian Navy band from nearby Esquimalt naval base and the pipes and drums of our local reserve infantry regiment, the 5th (Princess Mary’s) Canadian Scottish. If massed pipes and drums don’t make your hair stand on end, I’m afraid you have no soul. Here they are with our local symphony orchestra doing Amazing Grace. 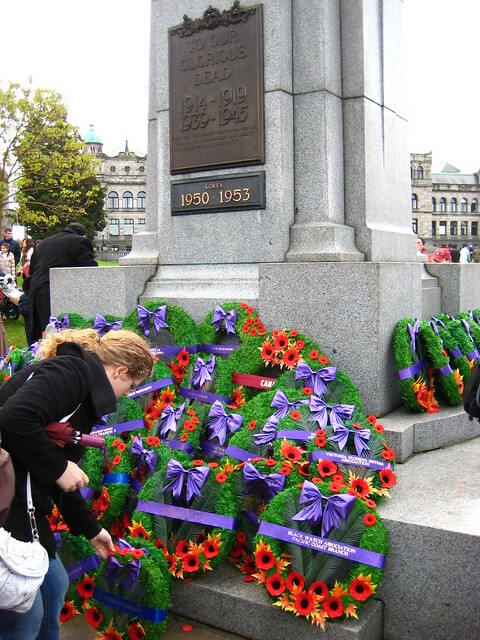 Went down to our main Cenotaph on the Legislature lawn this morning for the Remembrance Day ceremony, as I almost always do. Good turnout despite the threatening weather, and while it rained off and on through the ceremony and marchpast it had at least stopped bucketing down like it was earlier in the morning. I’ve always thought those of us who study war for recreational purposes should pay extra attention to Remembrance Day or the local equivalent. It’s not always lead soldiers and dice, after all. I’ve got a few more photos from our ceremony over on Flickr.